Whether you're joining line to snaps, hooks, swivels or lures the trilene knot will meet your needs. Simple, strong and reliable. That's what makes it the knot of choice for many bass fishermen. I've heard people say you can tie it in the dark. Don't know about you but I've tried for years to tie fishing knots in the dark. They must be kidding. If I can't see it I can't tie it. 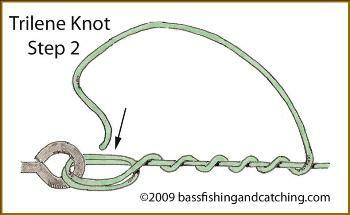 But, when you're trying to learn how to tie fishing knots this knot is a very simple knot to tie so learn it first. 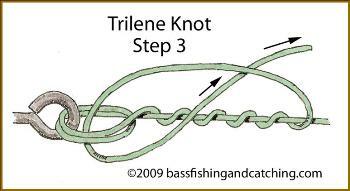 As a matter of fact, if you know how to tie the trilene and palomar knots you're virtually set when it comes to line-to-hook or line-to-lure connections. Thread your line through the eye of the hook or lure. Loop your line around and pass it through the eye again. Pull "firmly but slowly" on the main line and draw the loop down to about a quarter inch in size. Hold the lure or hook in one hand while at the same time holding the loop between the thumb and pointer finger of that hand. Take the tag line in the other hand and wrap it around the main (standing) line 5-7 times. Guide the tag line around and back through the double loop that you formed just above the hook eye. After passing it through the double loop push the tag end back and through the larger loop. Then pull the main line, while also holding the tag end beside it, and the hook in opposite directions. Make sure to wet your line. The knot will form and snug against the hook eye. Clip off the tag end.